The mission of the Prayer Shawl Ministry is to provide hope, comfort, and healing. It is a unique way of reaching out to the community in a very tactile way. A prayer shawl can be seen as a symbolic “hug” from God. The Prayer Shawl Ministry brings together people who share a similar interest to share in fellowship and to put to use the talent of knitting and crocheting to create prayer shawls that will be given away to help spread the message of God’s mercy, love and compassion. Prayer shawls, sometimes called comfort shawls, peace shawls, or mantles, are intended to be a reminder of God’s ever present love. 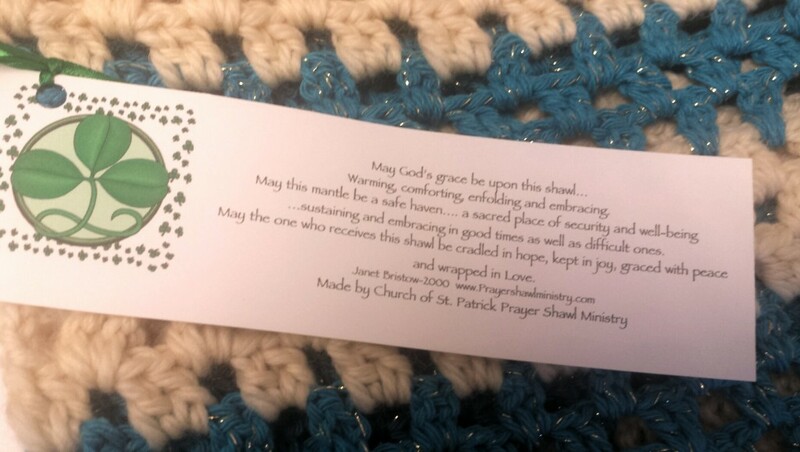 A prayer shawl is a gift for every time and every occasion—joyful or sorrowful, for every circumstance of life—chosen or unchosen, when you are weeping or when you are celebrating. The power of the prayer shawl is in its physical properties and source of warmth. When to Wear A Prayer Shawl? A prayer shawl is worn it in times of prayer. It can rest on the shoulders as one works, plays, reads or rest— as a cloak of God’s presence. It can be worn when one is drawn to prayer or needs to feel God’s love. The shawl can be drape it lightly across the shoulders or wrap tightly. It can be used as a blanket like covering. At times one may cling to a prayer shawl because they are clinging to God; not wanting to be far from it. At other times one will reach for it only occasionally. One may want to always keep the prayer shawl; or someday one may feel prompted by God to pass it on to someone else. For thousands of years, prayer has been a powerful source of healing. The early Jews called their garment a tallit. Originally the word meant gown or cloak. This was a rectangular mantle that looked like a blanket and was worn by men. After the exile of the Jews from Israel and their dispersion, they came to adopt the fashion of their gentile neighbors more readily. The tallit was discarded as a daily habit and it became a religious garment used for prayer; hence its later meaning of prayer shawl. Each color, twist, knot and decoration had to do with one of the laws of the early Jews and were reminders for them. In 1998, Janet Bristow and Victoria Galo were in Hartford, Connecticut decided to combine compassion and their love of knitting into a powerful ecumenical ministry and spiritual practice that reaches out to those in need of comfort and solace, as well as in celebration and joy. Visit the national Prayer Shawl Ministry website for more information. refers to the practice of working and praying. A prayer shawl is a labor of love in prayer and work. The shawl maker always begins with prayer. Prayer is continued throughout the creation of the shawl. The shawl maker spends approximately 20 hours knitting and praying to create each shawl. The entire ministry prays over the shawls and a priest blesses the shawls before the shawls are gifted. The blessing ripples from person-to-person, with both the giver and receiver feeling the unconditional embrace of God! The Prayer Shawl Ministry is a faith sharing community. 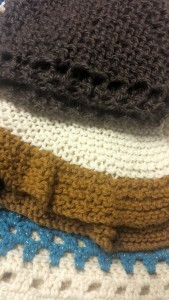 Do you know someone who is in need of a prayer shawl? Perhaps you know of a friend or family member undergoing a physical or emotional challenge or someone who has experienced a personal loss or needs a tangible reminder that there are people who care, and that God continuously wraps each and every one of us in His endless love! Prayer shawls are given to celebrate the happy occassions filled with hope too, such as marriage ceremonies, the birth or baptism of a baby. Read God’s Embrace: The Story of a Prayer Shawl and realize the impact a prayer shawl can have on someone gifted with the mantle of God’s love. The ministry is open to anyone who has the skills to knit or crochet or who would like to learn how to knit or crochet. Whether you knit or crochet quickly or slowly, your help is welcome to make fulfill the mission of spreading God’s love through prayer shawls. 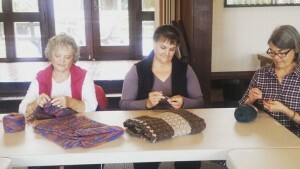 Even if you can’t attend the meetings, shawls can be created at home and given to an usher at Mass or dropped off at the Parish Center during business hours, Monday – Friday, 8 A.M. – 3 P.M. The Prayer Shawl Ministry meets in the Parish Center on the first Tuesday of the month at 10 A.M.